The brain is a precision instrument. Its function depends on finely calibrated electrical activity triggering the release of chemical messages between neurons. But sometimes the brain’s careful balance is knocked out of control, as in epilepsy. Electroencephalography, or EEG, visualizes a brain’s electrical activity and can reveal how an epileptic seizure diverges from the predictable wave pattern of typical brain activity. But medicine still lacks a solution to epilepsy. There’s limited possibility of predicting a seizure, and no way to intervene even when you can predict. Although pharmaceuticals are available to people dealing with epilepsy, they are fraught with side effects, and they do not work for everyone. 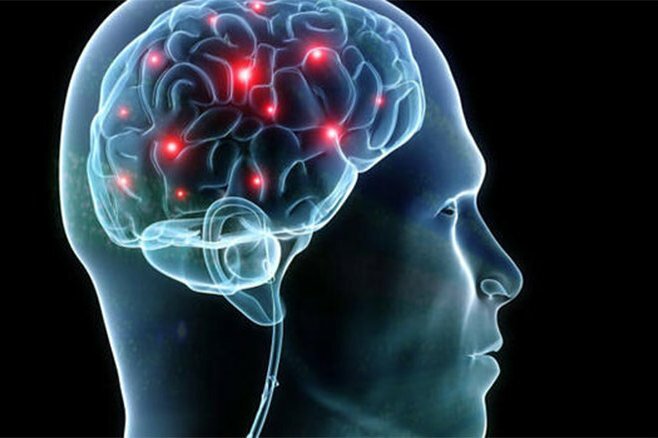 The pattern of typical brain activity is very regular. During an epileptic seizure, the electrical activity erratically spikes. Working on a problem in my neuroscience lab, when I stop to imagine how frightening it could be to live with a brain out of control in this way, it really motivates me. Could there be a way to seize back control of these neurons gone rogue? I’ve been focusing on how a specific compartment within each brain cell might be able to help us do just that. Ever since I was an undergraduate student, I’ve been fascinated with a part of the neuron called the axon initial segment. Each neuron contains this small compartment. It’s where a neuron “decides” to fire an electrical signal, sending a chemical message on to the next cell. There are specialized connections here that can exert powerful control; they can override the cell’s own “decision” about firing. This control mechanism exists to organize or pattern brain activity – a requirement for much of our behavior. For example, in order to fall asleep your brain activity needs to wind down into a slow oscillation. In contrast, sharp concentration on a problem requires the pattern to pick up, producing a rapid oscillation. An inability to produce and regulate these patterns of brain activity has been related to numerous disorders of the brain. When the axon initial segments of numerous neurons all receive a silencing signal at the same time, it results in a trough in the wave pattern of the EEG. This means that it quiets the brain’s activity, something that under normal conditions would be useful when moving between relaxed awake and sleep states. 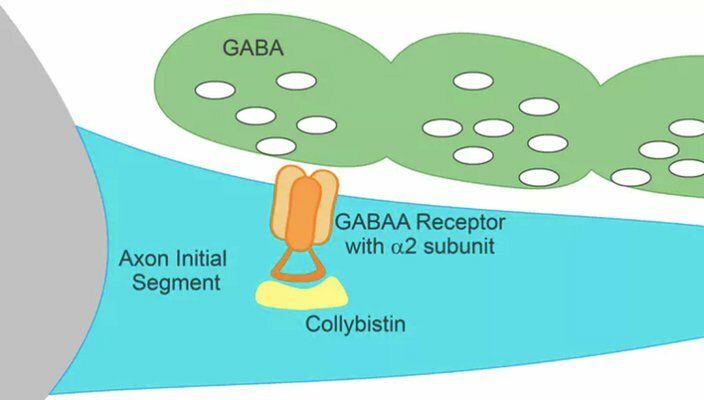 Together, the GABA receptor protein and collybistin work together to receive the message from the neurotransmitter GABA within this important part of the neuron. If researchers could harness the power of these inhibitory connections, we could potentially reset the brain’s activity pattern whenever we want to. It could be a way to wrest back control in an epileptic brain. To begin understanding how to regulate this power of the axon initial segment, my colleagues and I first needed to understand the molecular partnerships at these connections. For inhibition to be effective at the axon initial segment, there needs to be the right equipment available to receive the signal. In the case of inhibition in the brain, this equipment is the GABA A receptor. With collaborators Hans Maric and Hermann Schindelin, we identified a close and exclusive partnership between two proteins – the GABA A receptor α2 subunit and collybistin. Figuring out the close relationship between these two molecules answers some open questions about how proteins at inhibitory contact sites might be interacting. We knew that the GABA A receptor α2 subunit is found at the axon initial segment, but researchers didn’t understand how it gets there or is kept there. Collybistin could be key. The axon initial segment receives signals from adjacent neurons and ‘decides’ whether its own neuron will fire an electrical signal in response. So now we thought that these two proteins could be working together at the axon initial segment. To take it further, my postdoctoral mentor Stephen Moss and I wanted to understand what implications this might have for connections at the axon initial segment, and ultimately how the brain works. To try to figure that out, we created a genetic mutation that resulted in the two proteins being unable to connect. Neurons of mice with this mutation did, in fact, lose inhibitory connections onto the axon initial segment. Inhibitory connections onto other parts of brain cells remained intact, again supporting the idea that this protein partnership is exclusive, and specifically important at the axon initial segment. Mice with this mutation experience seizures during development. When they grow into adults, these mice no longer show behavioral signs of seizure. In some forms of pediatric epilepsy, kids can also “outgrow” their seizures. So this mutation is extremely valuable in providing a possible model for human pediatric epilepsy. We hope it can help us understand more clearly what happens in the brain during epilepsy, and also to design and test better therapies, like the selective compound developed by AstraZeneca whose scientists also contributed to this project. 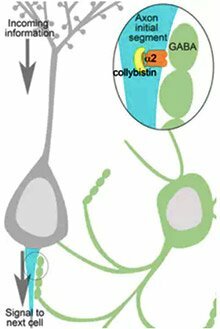 Neuroscientists have long speculated about the partnership between the GABA A receptor and collybistin. Now our results, recently published in Nature Communications, define it quantitatively. While we know GABA A receptors – which respond to the neurotransmitter GABA – control inhibitory signaling, we’re still figuring out how it all works. GABA signaling is diverse, with various connection types that exert distinct control over cell firing – something else we need to work to understand. And dysfunction in GABA signaling is involved in a number of other disorders of the brain, too, in addition to epilepsy. The ultimate goal of this research is to design treatments that might be able to control inhibitory connections at the axon initial segment. We’d like to be in charge of that switch, able to turn off the out-of-control neural firing seen during an epileptic seizure. I am imagining life with epilepsy, and I am also imagining life without it.